Is it safe to say we’re finally done mowing for the year? While you might still be doing a little leaf-mulching and clean-up with your trusty walk behind, tractor, or zero turn lawnmower, we all know it’s about time to park it for the winter and gear up for snow removal. Okay – that was a touching moment. But now another end-of-season question – do you just lock your mower in the shed or the barn and deal with maintenance in March or April? We hope you didn’t just say yes! You’ve made a significant investment in your mower, and you spend so much quality time with it all summer – now is not the time to abandon it, dirty all over, in desperate need of an oil change, and with dull, dinged-up blades! Show it some love before tucking it away! And if you need parts or repair service, we will always give you an honest quote before just diving in. 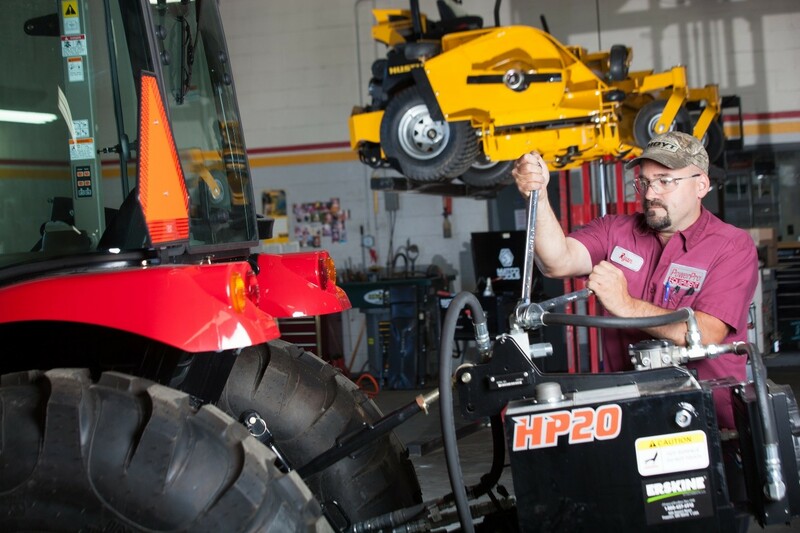 Our experienced service technicians are lawn equipment owners themselves, after all, and respect your wallet as much as they respect your expectation for high-quality, no-details-overlooked work. When you pull your mower back out in the spring, you want it to be ready to go, plain and simple. You can almost see your yard getting longer by the minute when the weather warms up, and you know that it’s a race to get ahead of your neighbors on lawn care (before they start wondering what’s wrong with you)! Of course, if you left last year’s gas in the tank and have a bunch of debris contaminating the (dirty, old) oil in your oil tank, your mower may not even start. And that means it’s time for rushed, last-minute maintenance just so you can get to work, which means you may have to neglect less pressing tasks like adjusting the steering or making sure your deck is totally clean. Your mower doesn’t deserve to suffer from your lack of planning! Make that service appointment now and show your mower how much you care. By doing maintenance now, you’ll be ahead of the curve. It bears repeating that we will literally reward you for maintaining your mower now instead of waiting until spring. Here at PowerPro Equipment, when you sign up for our Preventative Maintenance Program (PMP) and schedule your service before December 29, 2018, we’ll take 10% off your invoice. Whether you have a zero turn, a walk behind, a lawn tractor, a single-blade push mower, or even a gas-powered utility vehicle, we can offer you a great deal this fall. Plus, we provide service for many more types of equipment – just give us a call today at 1-800-832-2228 for more information and to sign up for our PMP! Get Him What He “Really” Wants this Holiday Season! Ready to Make Winter Fun Again? Our Biggest Sale of the Year is Coming to ALL PowerPro Locations! Why Choose a Spartan Mower Over the Rest? Power Pro Equipment York Store & Showroom Grand Opening!